What if a Boy was Born with a Camera for a Head? Evening. Your short bed time story tonight is a delightful short film about a child who was born with a camera for a face. I remember when John Stanmeyer’s photograph was unveiled as the World Press Photo of the Year award in 2014. There was the usual controversy but, uncommonly it was understood immediately by most. The importance and prevalence of mobile phones in society was all the explanation a casual viewer needed. Beyond that it was perhaps seen as something quite comical by mimicking an experience anyone with bad cell reception has had. As Stanmeyer explains the people in the image holding their phones aloft are doing something called “catching” where they try to catch a signal from neighbouring Somalia where cell networks are among the cheapest in the world. Those lucky enough to manage it are able to Skype and phone their loved ones back home at a far cheaper cost. Thanks for the tip, Matthew. Music videos can be a hive of experimental photography. Often a director will take an idea they’ve seen and put it into practise to produce surreal often breathtaking results using unorthodox camera techniques. Richie Johnston is one such filmmaker that demonstrates how subverting a traditional photographic process called slit scan photography can be used to create mesmerising visuals for the musician’s audience. The film was made to coincide with the Just Music’s Ambient Zone 2 compilation and clocks in at almost an hour in length. Throughout the performance ballet dancer Rachel Bodger moves in a slow, rhythmic motion drawing on the obvious quirk of photography to elongate her body and draw patterns within the frame. The result is hard to turn away from. After a few minutes it’s clear that the dancer’s improvisation is geared towards the photography used rather than the music, although it compliments it perfectly. We compiled a few screenshots that show the different patterns Bodger and Johnston’s collaboration achieved and at Phogotraphy we truly think they are marvellous! If you’re interested in slit scan photography and want to try to do something similar in a project of your own, Richie Johnston put together a short ‘making of’ video to guide us through the thoughts and processes involved in the production. It’s well worth a look, maybe more so than even the highly polished film above. Video and stills used with explicit permission of the Richie Johnston. One of the main jobs the Apollo astronauts were given was to be photographers. Apart from scientists, pilots and straight up adventurers these men had to learn how to use a camera in Space. The reason being to give a visual exploration of the barren, dusty Lunar surface for the humble Earthlings back home. Despite having live video feed transmitted back to Houston and broadcast all over the world, the quality was substandard. NASA relied on some specially manufactured Hasselblad film cameras to provide clean, crisp and high resolution photographs to study at a later date. What we’ve rediscovered is some old archive footage of a photo shoot on the Moon taking place. It is a wonderful moment to watch! 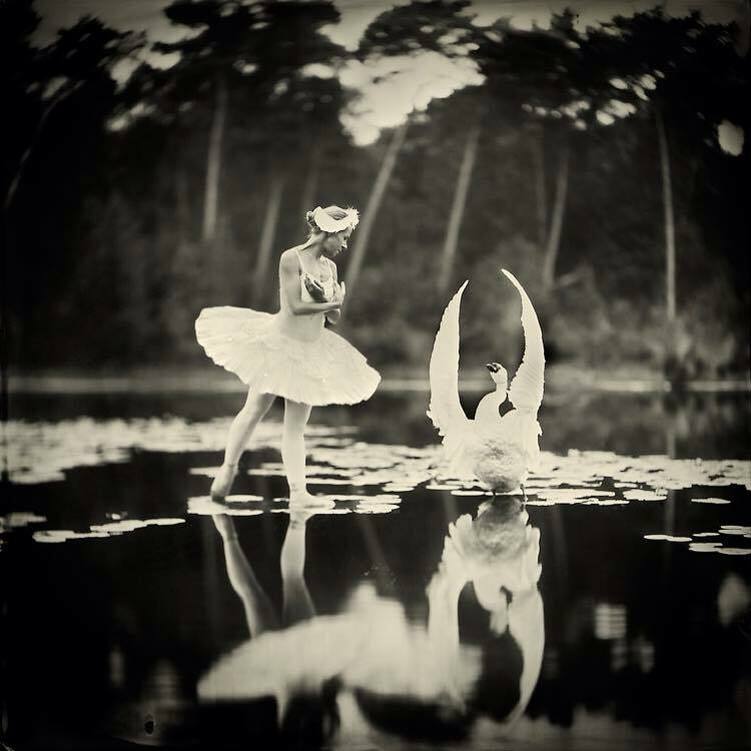 It’s a cry photographers know all to well, “the final shot of the day was the one, I’d finally cracked it” and that rings true for Alex Timmermans’ most recent wet plate collodion creation ‘Swan Lake’. A man who strives in meeting a bar of perfection set so high he’s known to keep working on a set until sheer beauty is realised. Just take a look at the final plate. Experimental Video: Projecting Moving Images on to Clouds. In what has been hailed as the first of its kind, scientists have embraced the old art of the moving image to project an image of a galloping horse onto clouds from a plane. The horse and rider, an obvious reference to Eadweard Muybridge’s photographic studies of motion appears as a ghostly green shadow in the clouds courtesy of a modified zoopraxiscope by artist Dave Lynch. Here in the video you can see the contraption’s internal workings prior to scenes shot from a plane. If viewed from the ground it’s unlikely you’d see anything but flashing random lights dancing within the clouds. Despite the feat of imagination it will have taken to achieve, the final product is still somewhat shaky and basic in design. We really look forward to seeing what advances in visual technology are made as a result. It’s worth taking a trip to Dave Lynch’s website to learn more about the collaboration involved in ‘Project Nimbus’ and the three years of documented effort that went in to its creation. via Gizmodo via New Scientist.